I’m seeing stripes again. But in a goooood way. It’s been a few weeks since I’ve finished my last knitting project and it’s been so hard to bite my tongue because I’m in love with it. Of course, it was super secret. Super secret is my new theme for knitting. Shhh… don’t tell. I torture myself with super secrets, but they’re usually worth it. As this one proved to be as well. I gifted the super secret last night. To a good friend. Who is expecting. (Who isn’t expecting these days? Riddle me that?) So I made a special little something for her special little gal who’s making her debut in just one week. I really, really like it. 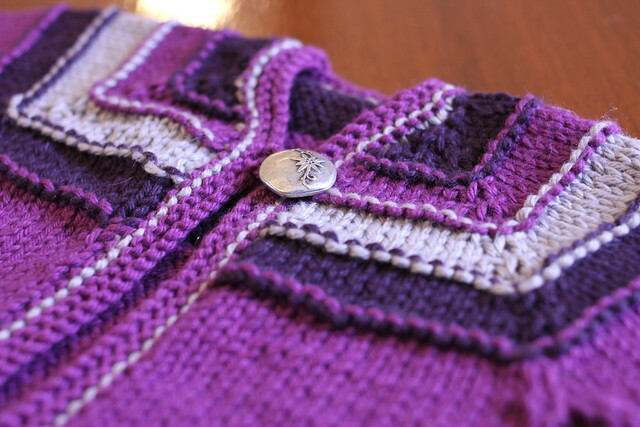 Not just the pattern – the pattern is super easy and looks great and it’s free – but the colors and the yarn. 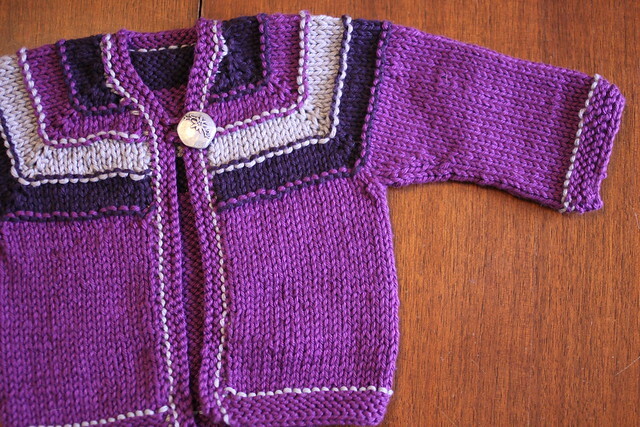 In all the examples I could find of this little sweater, everyone had made it for baby boys. It really is a unisex sweater but I wanted to girl it up a bit without making it fru-fru. Thus the cool purples and gray. The little silver floral button ties it all together. At least in my opinion it does. And today, my opinion is all that matters to me. The cotton and pima yarn… it’s so soft and snuggle-y… and still washable. Apparently, that’s a very important thing in baby wardrobes. And will be perfect to layer for this fall. The stripes are what sold me. The purls make the transitions between colors stand out. It would look nice in a solid color too, but why would you not want stripes? My only beef is when I slipped off stitches to work on the back and arms, I did not have the number of stitches the pattern said I should. I had to add two stitches on the back and both arms. No biggie. But I thought I had messed up somewhere… and kept counting my stitches over and over again… and I hate counting stitches. Finishing the piece was a tad difficult as the holes under the arms were much larger than I expected, but a mattress seam helped hide them. And it may have taken me 30 minutes to crochet a one inch chain. (That happens when you’ve never crocheted before.) In the end though, I’m a huge fan. I can’t wait to see weeMohn in her purple stripes. Out of all the baby pieces I’ve knitted, I’ve only seen two little guys in little hats I made, so now I have something to look forward to. I might also look forward to seeing weeMohn herself. Very excited for our friends and their new addition – and hope to hear good news in the next week! rachel - I love crocheting, but yes I keep a notebook so I can keep track of the number of stitches I have done. I heard it is good practice to have some kind of row marker which I should probably do because I do lose track. The sweater looks awesome. I have not gotten to that point where I can do clothes yet since all the stitches have to be pretty even and precise! Way to go! J. Smith - You’re just a rockstar. That’s all. shemohn - It’s adorable, and I can’t wait for Claire to wear it. You’re pretty awesome! Love ya.